I am writing to update you on an important issue relating to your land on Brush Road in the Los Gatos Mountains, and frankly, to ask for your help. 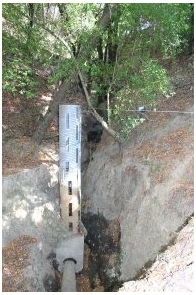 As you may recall, about 30 months ago, a storm-generated flow of water through a culvert which collects water and drains it under Brush Road caused a failure in the pipe, such that the water enters the pipe at the base of the structure instead of through the top. (See picture) This resulted in a collapse of the land around the vertical pipe, as all of that dirt was sucked through the pipe. Prior to the failure, the level of the dirt filled in this area so that just the top four slots of the vertical pipe were visible. The present state of the failure results in a 60 foot cliff at the edge of the road, (that is a car at the top of the second picture). 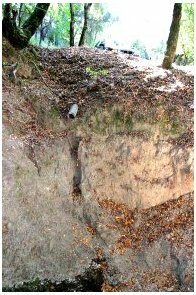 This failure threatens to continue to develop, possibly causing a collapse of Brush Road, (making it impossible to get to your land, and the rest of Brush Road), and flow of all of this dirt down the hill onto and potentially blocking State Highway 17. The failure occurred on your land. I am the current President of the Brush Road Corporation, and we have easements from all of the property owners up here for the road as it begins just before the Gate to the where the road ends up in the mountains, and we collect annual fees and maintain the road, as you know. Before the State built Highway 17, Brush Road connected to the rest of the world via Ridge Road (which is now the dead end you would take if you went right instead of left through the Brush Road Gate). In 1939 the State eliminated the Ridge Road connection to Raineri Road (show in gray on the next page), and built a new connector which connected the new expressway to our neighborhood via the current route. They built the drainage structure, filled the canyon, and built a road across it to provide for vehicle access to our lands. In 1942 they purchased some of the land underneath the new connector (from State Highway 17 up to the beginning of the curve), but they never acquired the parts of your land where they built this drain structure and road. In any case, the State has maintained the road all the way up to the Gate over these past 70 years, including occasionally removing excess dirt that accumulated around the vertical part of the drain structure. As such, the Brush Road Corporation maintains the position that the entire road up to just before the Brush Road Gate is a State road and that the State is responsible for the maintenance & repair of the road, and any also for any liability that might arise from failure to do so. We shared our position with you two years ago when we first announced this problem to our members, and have updated you occasionally as events progressed. They have been progressing slowly. Luckily, we have had two dry winters. After much back and forth, the State made an offer to advance $20k to help pay to repair the culvert, if we used a contactor they approved and implemented a plan they approved, and took on maintenance responsibilities for all time. Without agreeing, we sought & obtained two bids, each for just over $100k. We communicated these bids to the State, and they told us their attorney who had been working on the matter has been reassigned, and that they have assigned a new attorney. As such the new attorney has backed down from all of these offers. Attached is my most recent email to the Brush Road attorney responding to the most recent words from the State. The bottom line is that there are a lot of details here, and we need your help. The responsibility for fixing the road could be the State of California, it could be the Brush Road Corporation, or it could be yours. Of course you are also a member of the Brush Road Corporation, so you are involved twice. I would love to meet with you in your offices to talk about our options. You may have good connections with various agencies which we could employ to get a good outcome, quickly. We have contacted our state senator (Al Maldonado), and gotten him to write a letter of inquiry. In summary, the drainage culvert has failed and the road is in danger of collapsing. The states current position is that they won't pay for work that is not on their right of way, and hence we need to fix the culvert, and moreover we would be liablle for damages the failure might do to State Highway 17. This section of the road is not part of the Brush Road Association's jurisdiction, yet we all have an interest in solving this so that we don't lose access to our homes in the event the road should collapse. Because this culvert is on your land we need your help to resolve this. One possible approach might be for you to deed this section of land to the state...along with the problem. Ideally, I would like to meet face to face with you (perhaps at your offices, and perhaps bringing the other two Brush Road Board members with me (you know Carrie Martin, and may also know Scott Landstrom) and share with you all of the information we have, the letters we have sent and recevied, and strategize on a plan to move forward on this matter. Attached is the most recent letter from the State, and below our response to our attorney. Please convey to Frank that Brush Road never rejected the State's offer of monetary contribution to the project; instead as a part of that offer at the State's request we have put in significant effort of time and money to obtain an engineering analysis of a possible repair, and to obtain and present to CalTrans two estimates for the cost of such a repair, and we are to this day still awaiting their comment on the suitability of the engineering plan, and their opinion on the estimates. Our understanding of their offer was that in exchange for Brush Road performing these services, the State would contribute to the cost of repair, and then would convey to the Brush Road Corporation ownership and maintenance responsibilities for this road spur in perpetuity. 1.5 "Brush Road" Defined. For all purposes of these Bylaws "Brush Road" shall mean and include (a) that private road or roadway popularly known as 'Brush Road' in the Township of Los Gatos, County of Santa Clara, California, which commences 22 feet before, and toward State Route 17 from, the Entrance Gate and terminates at parcel numbered 544-33-031, and (b) that private road or roadway branching off therefrom popularly known as 'Old Well Road', which terminates at the cul-de-sac adjacent to parcels numbered 544-56-006, 544-56-007, and 544-56-019. You can see on the attached County maps (544-35.pdf and 544-34.pdf) where Brush Road begins (the Entrance Gate is on parcel 76 on 544-34, between the sub-parcels 246 and 245).The 544-35 pdf shows the State of California land (Parcel 11) over which the spur runs, and by implication, although it is not shown, the place on Parcel 2 where the culvert is, and where the failure lies. The fact that Brush Road is clearly delineated on the County tax maps, but this spur of road is not further supports the fact that this spur is not a part of Brush Road. This spur of road and its now failing drain structure was built by the State of California as an integral part of building State Highway 17 in 1939, and the State has maintained this spur of road and the drain structure ever since. Before State Highway 17 was built, Brush Road connected to the rest of the world via Ridge Road, which used to extend across where State Highway 17 now lies and on to connect with what is now called Old Santa Cruz Highway. 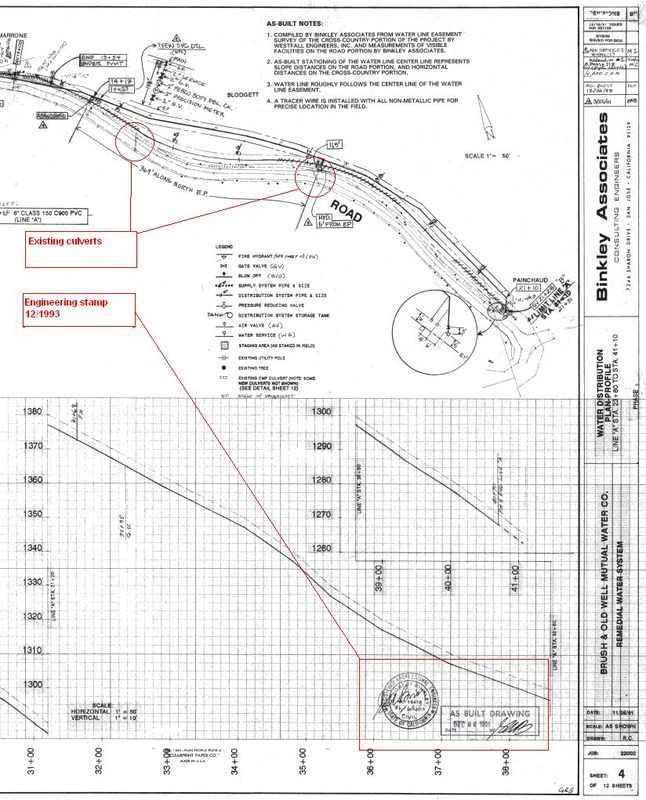 We provided the state attorneys with it's own as-built diagram for SH 17 which shows all of these facts, shows the old Ridge Road, and shows the plan for building the spur, the drain structure, and documents its as built locations. The Brush Road Corporation did not build, nor did it ever maintain this road spur or drain structure. The State has a prescriptive easement over this property (a portion of Parcel 2), as it performed "hostile, actual, open and notorious, exclusive and continuous for a period of years" possession of this piece of land by constructing a drain structure which extends from its land (Parcel 11) onto this land, and building a road which extends from its land (again, Parcel 11) to cross this land and to connect with the pre-existing Brush Road, and the State has actively maintained the road ever since. So as a result, the entity who is threatening to violate S&HC 725 is the California Department of Transportation. It is clearly acknowledged by everyone on Brush Road and by the State of California that the failure of the drainage structure component of the state-built spur from Highway 17 to the beginning of Brush Road is not the fault of the Corporation. That said, the members of the Corporation do have a very definite interest in having this failure repaired, as a continued evolution of the failure could lead to a partial, or complete collapse of the spur, making vehicular access to the properties on Brush Road from the rest of the world impossible. Note that the future collapse of the road spur would happen long before any water might run onto State Highway 17, as a second culvert structure exists (built at the same time as part of the same project) which conveys the water that currently runs through, but later might run over the failing structure, down and underneath the State Highway. Of course, this second culvert well may be ready to collapse just as its sibling structure did three years ago: they are both the same age, built using the same methods by the same people; and have further been maintained by the same folks for the past 70 years.